Ha ha ha!! Have you ever done that, before Hallowe’en? I say to myself “I’m going to avoid the shopping rush, and get the trick-or-treat candy now. That way I get the good stuff, and I’m prepared”. So you bring it home, tuck it in the cupboard or closet….then someone finds it! Or worse – you get a craving, and because you know where it is…. *Sigh* It happens just about every year at our house! Good intentions go straight to my hips, and I end up spending twice the money! Well, this year, I’m planning even further ahead – and I’m getting ready for the trick-or-treaters and my next class at the same time. What does this have to do with candy? 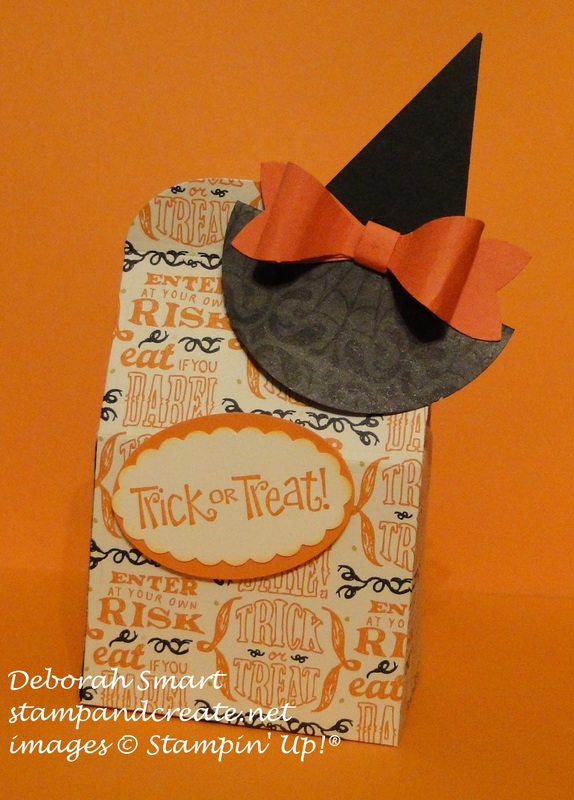 Well, the class is called ‘Treats Not Tricks’, and we’ll be making these eerily adorable boxes using the Baker’s Box Thinlits Dies – and putting the candy in them, right away! Aha!! 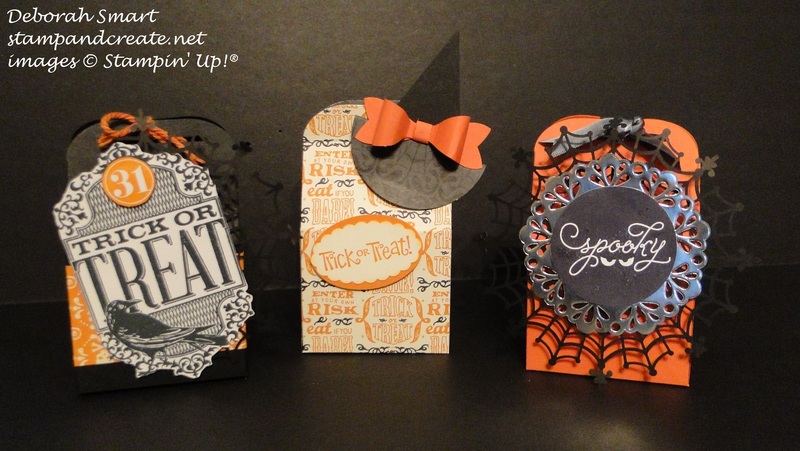 I just love this large Trick or Treat label from the Witches’ Night stamp set! I stamped it in Memento Black ink onto Whisper White cardstock, then fussy cut it (because I still haven’t bought the Lots of Labels Framelits), and added 1/2 of a Spider Web Doily behind it. 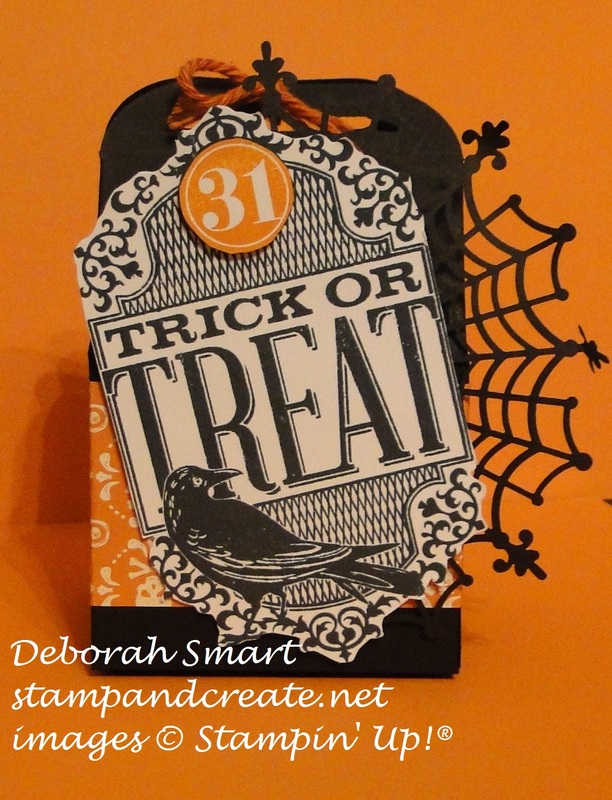 I stamped the ’31’ again in Pumpkin Pie ink, and attached it over top of the label, to add a bit more dimension. Some retired Baker’s Twine to tie the top together, and it was done! This next one I made using the retired DSP for the box; as long as your candies aren’t too heavy, and you use Tear & Tape to hold the bottom closed, it’ll be sturdy enough. Look – it’s that adorable witches’ hat again!! If you didn’t see yesterday’s post, do yourself a favour and scroll down – you can see it on top of a Curvy Keepsake box pumpkin 🙂 This time, I punched the top of the hat from Basic Black cardstock using the Tree Punch, and used the 2 1/2″ Circle Punch to cut the bottom of the hat from DSP. This time, it’s attached to one of our mini clothes pins, so that the top of the box can be opened, then re-closed again, without tearing into the box! I used the Among the Branches stamp set and stamped the ‘spooky’ in Elegant Eggplant ink onto Whisper White cardstock, and used the 2 1/2″ Circle Punch to punch it out. I then backed it with a medium sized Metallic Silver Doily, then layered that on top of a full Spider Web Doily. I just love these doilies!! A piece of retired black ribbon ties the box top closed – quick & easy! If you live in my area (North Burnaby, B.C.) and would like to come & make these fabulous treat boxes for your friends & family, there’s still room in the class! You can check out the details on my ‘Events’ page or in the Calendar – the dates are Oct. 15th and 16th, at 2 different times. Just give me a call or email to reserve your spot! I hope you enjoyed today’s post – thanks for spending some time with me today! Previous Previous post: Blogging Friends Blog Hop! Hi Deb, Your treat boxes are too cute for words. I don’t have that box die yet but you have sold me on it!! I host most of the holidays and love to put some little treat at every place setting. The size you show is just perfect! Love all of your designs! I think I need those web doilies!! Hi Laura! You’ll really like the Baker’s Box die; it’s so easy to put together, and makes a ‘wow’ impression! 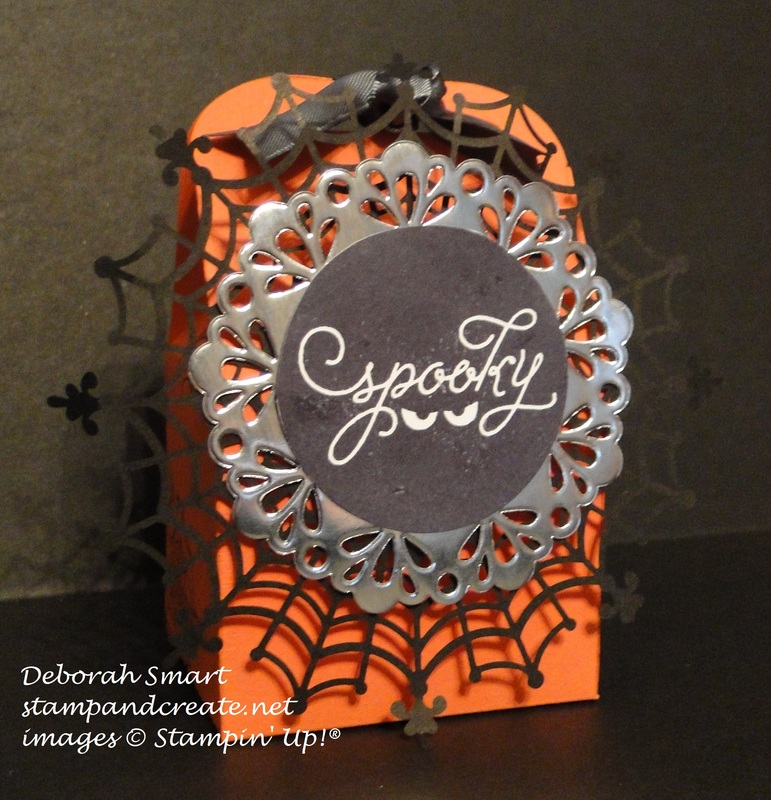 (and yes, you really DO need the spider web doilies, too! ;) ) Thanks so much for taking the time to comment!